Dreary, rainy day and night in Maine. Has me thinking about Layne Staley. Need a Murder Weapon? Try Rice. So rice is in the news, and for all the wrong reasons. Come to find out, rice is loaded with arsenic. This according to a new study released by Consumer Reports. Arsenic, as you may know, is a heavy metal with many uses, not least of which is murder through poisoning. Arsenic intake at high doses causes diarrhea, vomiting, blood in the urine, cramping muscles, hair loss, stomach pain, and convulsions. It shuts down the lungs, kidneys and liver. Eventually, it results in coma and death. Now, no one is saying that there's a lot of arsenic in rice. There's just a little arsenic. Chronic exposure to arsenic in low doses over time is associated with heart disease, stroke, bladder cancer, skin cancer, lung cancer, and diabetes. These are things that won't kill you today, but you still might prefer not to have. I mention this because I eat a lot of rice. Or did until yesterday. Rice is (was) a staple of my diet. For example, I've often eaten rice cakes as snacks. Rice cakes make good snacks because 1) they taste like cardboard and 2) within 15 minutes of eating one, you become much hungrier than before, so ravenously hungry in fact, that you feel sick and your body starts to shake with hunger sickness. The combination of 1) and 2) tends to discourage you from snacking between meals. This keeps you thin. Mostly, I have eaten a lot of chicken and rice. I do (did) this because, eaten along with a vegetable like broccoli, chicken and rice is (was) a very healthy meal. To be clear, the chickens I eat are not your typical factory-farmed chickens, who are basically victims of a chicken holocaust, living and dying in mini-chicken-Auschwitzes across this great land of ours. No. The chickens I eat are the very most organic happy chickens, who are treated much like guests of the Ritz-Carlton hotel chain, and who are priced accordingly. These are healthy chickens. But we were talking about rice, weren't we? Yes. Very bad. The rice is poisoned with arsenic. Arsenic is a toxic chemical. 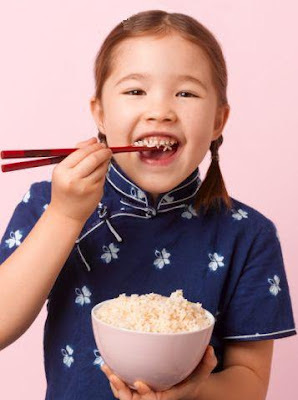 For those of you that enjoy irony, the good healthy brown rice has higher levels of arsenic than the vitamin-denuded and much-maligned white rice. Also, the rice you buy at fancypants Whole Foods tends to have more arsenic than the rice you buy at regular po' people supermarkets. Thankfully, we have the United States Food and Drug Administration (FDA), which is tasked with making sure that our food supply and the prescription drugs we take are safe. The FDA has weighed in on this rice issue, saying, "Based on the currently available data and scientific literature the FDA does not have an adequate scientific basis to recommend changes by consumers regarding their consumption of rice and rice products." I've worked in government and feel qualified to translate gov-speak into a language everyone can understand. It goes a little something like this: "Rice growers are a powerful lobby. It's better that we don't annoy them. So keep eating rice, you dummies! It probably won't kill you. Today."